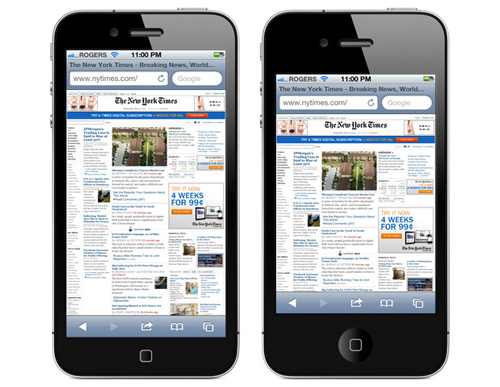 Keep the same resolution (pixels per square inch) as the iPhone 4 and iPhone 4S. A new 16:9 screen ratio, like an HD TV, which is good for watching movies but could make some apps to feel awkward while in landscape mode. A lot of iPhone apps are already “elastic” when it comes to screen height. You can test this today by making a VoIP call and switching to another app. The menu bar doubles in size. Some apps will adjust just fine to that. But many other apps will need developer work in order to look good on the new screen. By making the screen longer but not wider, Apple could possibly keep the same phone size. In a world where Android phones are becoming ridiculously big, this would be a welcome example of Think Different. See artist rendition above. Because of the way LCD screens are manufactured, it makes sense to keep the same resolution as today’s phone and just cut the panels to a different size. Changing the resolution which would require a new production line which can be complicated and expensive. One thing that most people don’t understand, however, is that making such a phone is not just as simple as slapping the parts together. Rather, it’s a balancing act. Increasing the screen size – all other things equal – implies higher power requirements thus shorter battery time. Apple will also want a faster processor, a thinner form factor, LTE, etc. Can it be done? Maybe – there are other variables: new thinner and lower power screen technology; more advanced chip manufacturing processes; a smaller Dock connector could all help.